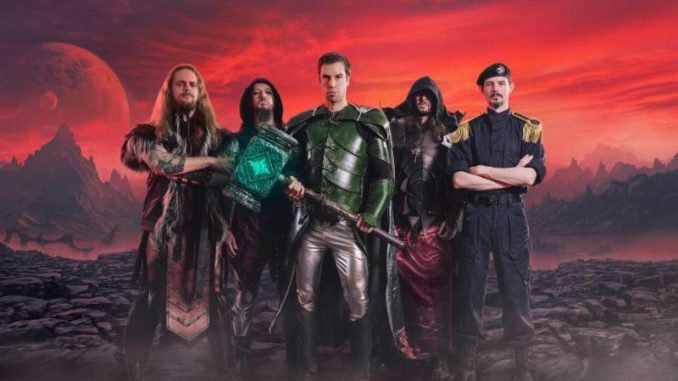 Symphonic power metal purveyors GLORYHAMMER have released the first single and official music video cut from their highly-anticipated third studio album Legends from Beyond the Galactic Terrorvortex – out May 31, 2019 via Napalm Records. Pre-orders for Legends from Beyond the Galactic Terrorvortex are now available HERE. On their 2013 debut album, Tales from the Kingdom of Fife, GLORYHAMMER‘s story began with the tale of an alternate-history medieval Scotland – a realm of dragons, wizards, magic and dark sorcery. The story tells the legend of the glorious hero Angus McFife XIII, who wages a long war against the evil sorcerer Zargothrax, in order to free the people of Dundee! In this latest installment of the GLORYHAMMER story, the galaxy waits in fear for the return of Angus McFife XIII, who fought the greatest battle the galaxy has ever heard of, against Zargothrax. All hope of the Kingdom of Fife lies in the strong arms and the infinite wisdom of their young prince. For Legends from Beyond the Galactic Terrorvortex, the five heroes around Angus McFife XIII created the galactic hymn,“Gloryhammer”, which tells the story about their own journey through time and space, the greatest battles of all times and neverending glory. Listen to the new single HERE! 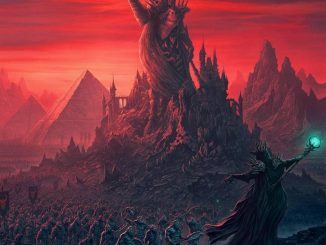 GLORYHAMMER‘s new album Legends from Beyond the Galactic Terrorvortex will tell us the whole story of the most gigantic battle of all time. Until then, we expect to receive more parts of what will end as the best power metal album the galaxy has ever seen. Keep your eyes and ears open! In conjunction with the release of Legends from Beyond the Galactic Terrorvortex, GLORYHAMMER will head out on a North American headline tour in late spring, featuring support from Aether Realm! The tour will kick off in Brooklyn, NY at the Knitting Factory on June 4, and will stop in several major cities, coming to an end on June 18 in Austin, TX at Come and Take it Live! See below for all confirmed tour dates. 6/18 – Austin, TX @ Come And Take It Live! GLORYHAMMER were founded by Alestorm frontman Christopher Bowes in 2009, who spent the next years gathering an international line-up that suited his idea to create a band based conceptually on the fantasy genre and musically fitting generally into the power metal mould. Both aims were achieved stunningly and their debut album, Tales from the Kingdom of Fife released by Napalm Records in 2013 immediately garnered the band high critical acclaim from critics and fans alike. GLORYHAMMER were able to top this success with their second full-length Space 1992: Rise of the Chaos Wizards (2015) and have continued to tour in front of ever growing audiences, performed at all major metal festivals, and have by now been nominated twice by German Metal Hammer as best band in the category “Up & Coming” at the Metal Hammer Awards. 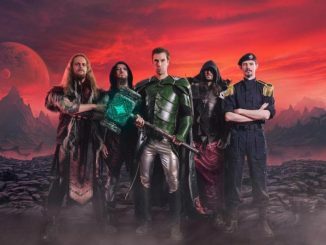 GLORYHAMMER Announces Release Date for New Album – Order “Legends From Beyond The Galactic Terrorvortex”, Out May 31!